Islam has made religion unmanageable. Had Islam not been around, it would not have been necessary to think in terms of the demise of religion itself. It is Islam that is forcing and will continue to force humankind away from religion. While non-Islamic religions made man into a delinquent, who kept muttering to himself, Islam has made man into a delinquent who has gone violently berserk. The delinquent has now to be shot a tranquilizer and then given a strong sedative to sober him up, so that mankind can bury the delinquent behavior of religion which Islam has made criminal, and after which humankind can continue its march of knowledge and science to plant the banner of humanity across the universe, and not waste its energies in fighting against itself in the narrow confines of planet earth. Hamas says: "Israel will rise and will remain erect until Islam eliminates it as it had eliminated its predecessors. The Islamic World is burning. It is incumbent upon each one of us to pour some water, little as it may be, with a view of extinguishing as much of the fire as he can, without awaiting action by the others." � "[O]ur struggle against the Jews is extremely wide-ranging and grave, so much so that it will need all the loyal efforts we can wield, to be followed by further steps and reinforced by successive battalions from the multifarious Arab and Islamic world, until the enemies are defeated and Allah's victory prevails. Thus we shall perceive them approaching in the horizon, and this will be known before long: `Allah has decreed: Lo! I very shall conquer, I and my messenger, lo! Allah is strong, almighty.'" � "Only under the shadow of Islam could the members of all regions coexist in safety and security for their lives, properties and rights. In the absence of Islam, conflict arises, oppression reigns, corruption is rampant and struggles and wars prevail." � ". . . Hamas has been looking forward to implement Allah's promise whatever time it might take. The prophet, prayer and peace be upon him, said: The time will not come until Muslims will fight the Jews (and kill them); until the Jews hide behind rocks and trees, which will cry: O Muslim! there is a Jew hiding behind me, come on and kill him!" � The Islamic Resistance Movement [Hamas] believes that the land of Palestine has been an Islamic Waqf [a religious endowment belonging ultimately to the Muslim nation's ruler] throughout the generations and until the Day of Resurrection, no one can renounce it or part of it, or abandon it or part of it. . . . This is the status [of the land] in Islamic Shari'a, and it is similar to all lands conquered by Islam by force, and made thereby Waqf lands upon their conquest, for all generations of Muslims until the Day of Resurrection." � "[Peace] initiatives, the so-called peaceful solutions, and the international conferences to resolve the Palestinian problem, are all contrary to the beliefs of the Islamic Resistance Movement. 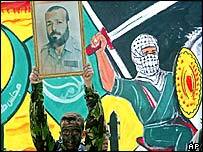 For renouncing any part of Palestine means renouncing part of the religion; the nationalism of the Islamic Resistance Movement is part of its faith, the movement educates its members to adhere to its principles and to raise the banner of Allah over their homeland as they fight their Jihad. . . . There is no solution to the Palestinian problem except by Jihad. The initiatives, proposals and International Conferences are but a waste of time, an exercise in futility." Can we negotiate with such an adversary?